Trowel Blade / Finish Blade, 6" x 14". 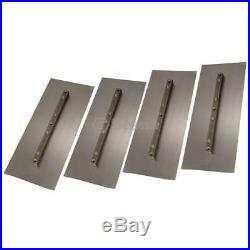 Trowel Blade / Finish Blade, 6" x 14" Pack Size:1 Wacker 79638, Allen AEC614F, Wagman WX-614F, Bartell Morrison 20414, Marshalltown M6093, Kraft SK100, Whiteman F-900, MBW 5347, Stone 34578, Stow 220227-501, Multiquip F-900 Stens 750-001 Length: 14 , Height. The item "Trowel Blade / Finish Blade, 6 x 14" is in sale since Sunday, November 12, 2017. This item is in the category "Home & Garden\Yard, Garden & Outdoor Living\Lawnmowers\Parts & Accessories". The seller is "ombwarehouse" and is located in Levittown, Pennsylvania. This item can be shipped to United States.